Impression T-Shirt Co. are printers of t-shirts and other garments plus caps & bags as well as mousemats and other textiles to order. 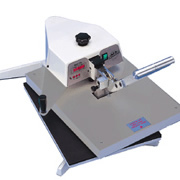 We are Digital Printers and all our designs are applied using a heat press. We have a minimum order of 1 shirt. If you wanted individual names/logo's printing on each shirt, we then offer a 'flex' heat applied service. If you require a full colour image on a shirt, we would then suggest a white shirt with a digital image heat pressed on, these are perfect for hen & stag events and promotional use. Also available in a similar heat pressed transfer onto dark shirts.